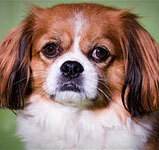 Is a Cavalier Maltese Mix the Right Dog for You? between a King Charles Cavalier Spaniel and a Maltese. They are a fairly rare Maltese mix that is growing in popularity because of their affectionate and playful personality. Read more about the Cavamalt below to see if this is the right Maltese mix for you. Do you have a Cavalier Maltese mix? Tell us more about his/her personality & your dog could be famous! These dogs take on the temperament of both King Charles Cavaliers and Maltese. They are lively and outgoing little dogs. Most are very intelligent and want to please; which makes them easy to train. They are great dogs for agility and obedience competitions, as they learn quick and are naturally well behaved. Some Cava-malts have a strong chasing instinct and most love to romp around outside. These dogs get along great with older children and other dogs. Most people find them to have a eager, yet gentle personality. If you already have a Maltese Cavalier King Charles Spaniel mix or know someone that does, check out these unique gifts for dog lovers below. 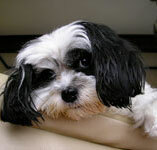 If you like long silky ears, and large soulful eyes, than this Maltese mix might be right for you! Cavalier Maltese mixes come in a variety of colors; with mixtures or red, white, black and tan depending on the Cavalier used to breed. Hair is usually long and silky, so be sure to groom them regularly as they are prone to tangling and matting. Since Cavaliers are average shedders, Cavamalts may shed a little or not at all. There is no guarantee either way. Full grown Bichon Maltese mixes can weigh anywhere from 8-16lbs. Do you have a Cavamalt? If so, your Maltese mix could be famous! Please tell us all about your dog and we'll put it on our website. What kind of personality does s(he) have? What makes him/her so special? Let other Maltese Maniacs know what to expect from a Cavamalt. Submissions must include at least 200 words of text and a picture to be accepted. Thanks!